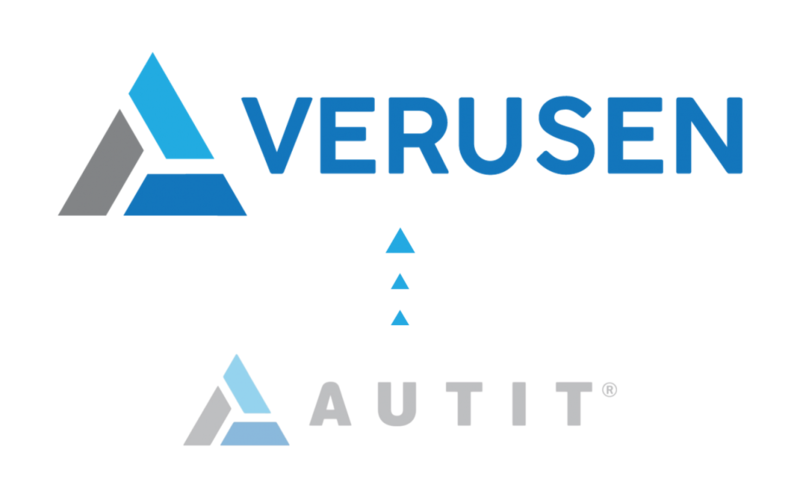 I’m excited to share that AUTIT is now Verusen! Our icon remains the same while our website is refreshed to reflect our new brand. Our new brand identity, Verusen, represents our commitment to help complex supply chains achieve more agility and drive out working capital costs. AUTIT was originally launched by our Founder and CEO Paul Noble in 2015 with an aim to solve the challenges he witnessed and experienced firsthand in indirect materials inventories. Manufacturing companies, specifically, had tremendous difficulty understanding their inventory levels throughout the supply chain. The origin of AUTIT was to provide companies with the ability to quickly and easily track inventories in material storerooms — really help plant workers do their jobs better. We were embraced by Fortune 500 manufacturers and their teams in getting a better handle on how much and where inventory was. This had the added benefit to corporate procurement teams in controlling materials purchasing. Our customers wanted to predict inventory needs to further optimize and improve procurement. However, there were deeper challenges to predict inventories; helping plants track inventories wasn’t enough. Large manufacturing companies were challenged by the underlying data systems — typically multiple ERPs — to truly understand materials inventories across a network of plants, not just singular plants. Visibility was challenging. Tracking materials that did not conform to naming conventions was a challenge. But with the rise in Artificial Intelligence and the addition of AI experts JR Lomas and George Tang, CTO and COO, respectively, AUTIT was able to develop the foundational layer for the intelligent digital supply chain — data harmonization. Armed with a powerful new neural net AI, AUTIT was able to help complex manufacturing companies and their supply chains aggregate their disparate inventory data into a true material master. The original platform was able to help companies identify 30% of inventory working capital reductions within the first year! And powered by AI, 1000x faster than traditional manual methods. With our new capabilities and a laser-focus on enabling complex supply chains to be more agile, we set about finding a new identity that would better reflect our vision and mission. This new brand and identity was going to help companies realize the power of leveraging technology to build trust between data and expert. When we thought about our vision and our mission, we thought about how we wanted to build a brand that would drive unity to supply chains. We wanted an identity to reflect a cohesive strategy for companies while having the transparency to execute. And finally, we wanted our new brand to signify the foundational layer of how we wanted to enable companies — bringing data together… in harmony. Verusen was perfect. We chose the name Verusen from looking into the Latin language. Our platform and technology is about understanding the truth in data — what’s real. From here, we found the Latin word “verus”. Then, we found the suffix “-en” to mean “to make; or, be made of”. Together, we created Verusen. To make truth. To make real. The name Verusen also evokes a strong familiarity, one that is reliable and confident. This is integral to how the world’s most complex supply chains trust our vision, our recommendations, and our company. Closing our 2018, we brought on several new key team members to help make 2019 our best year yet. Following closely to our launch of Verusen will be our new platform that will be launching in late February 2019. We are expanding our capabilities to help teams from procurement to operations and master data management (MDM) teams to harmonize, control, and predict inventory needs. We are holding launch events for our new platform in Atlanta and San Francisco in March 2019. Industry experts, innovation teams, and many more will be in attendance. Stay tuned for more information. We will continue building on our capabilities with artificial intelligence to enable supply chains for complex organizations — going deeper into manufacturing companies but also expanding into aerospace, automotive, distribution, and more! We believe in our ability to help complex supply chains be more agile, and thus, be more sustainable in an era of fast-evolving customer demand and expectations. Our vision includes the furtherance of (and adoption of) artificial intelligence. We see this to be a core element to building trust between experts and data. This helps teams be more scalable than ever before, and enable professionals to do what they do best — with efficiency and reliability. We are grateful for the opportunity to work with our customers and partners, and we are excited to work alongside you on building a more sustainable future.